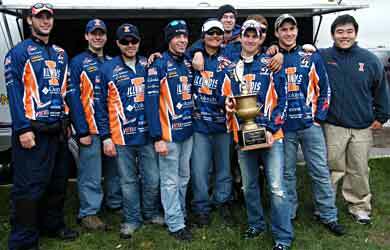 The University of Illinois bass fishing team are the 2010 Big Ten bass fishing champs after the Sunday, October 3rd championship event on Michigan's St. Clair River, holding off the University of Michigan and 2009 champs Michigan State University! Fishing was very tough due to a last minute change to the river because of gale force winds, and the cold and rain. Pictures and the weigh in video available on the Big Ten College Fishing message board.